Why Does My Pellet Plant Has Fewer Pellets Produced? Home > pelletizing technology > Why Does My Pellet Plant Has Fewer Pellets Produced? You have set your pellet plant, but you are sometimes experiencing an awkward situation where no pellets or fewer pellets are produced. This makes inexperienced people mad. How does this happen? What is wrong with my pellet machine? In general, that fewer pellets are produced has two reasons to consider, it is either the equipment is not correctly adjusted (especially the die and roller adjustment) or the raw material for making pellets is not mixed properly. GEMCO has helped many clients to build their pellet plant, from our experience, there are five main reasons that cause your pellet plant produce fewer pellets. Unmatched compression ratio of the ring die. If you are using a new ring die, the first thing before running the pellet machine is to check if the compression ratio is suitable for the raw material. If the compression ratio is too larger, the resistance force where the material is passing through the die hole becomes stronger, the pellets that are produced will have a higher density. As it required more power, the pellets output reduces. On the opposite, if the compression ratio is too small, the material is harder to pelletlized. If the compression ratio is found wrong, you need to change another one, besides, check if the inside wall of the die hole is smooth and if the ring die is out of round. The baseline is that low-quality ring die makes the pellet machine difficult to make pellets. Wearing in the hole. For ring die that is used for a while, check if the inner wall of the die hole is worn is a must. Also check if the roller is worn. Severe wearing could make a huge impact on the wood pellets output. For ring die that is badly worn, you can re-make the hole. For worn roller, you have to replace it with a brand new one. The gap between the ring die and roller needs to be correctly adjusted. For example, if making animal feed pellets are your purpose, this gap should be approximate 0.5mm. Gap that is too narrow will increase the chance of roller wearing, and will furthermore shorten the service lifetime of the ring die. While gap that is too wide will make the roller slippy and reduce the pellet output capacity. The feeding material is not properly conditioned. An extra attention shall be paid especially to the water content of the raw material before feeding into the pellet mill. Normally, 13% water content is ok. Too much water in the raw material results in too much water in the conditioned material. As a consequence, the material may be stuck inside the pressing chamber of the ring die, reducing the pellets output. Material in the ring die is not evenly distributed. 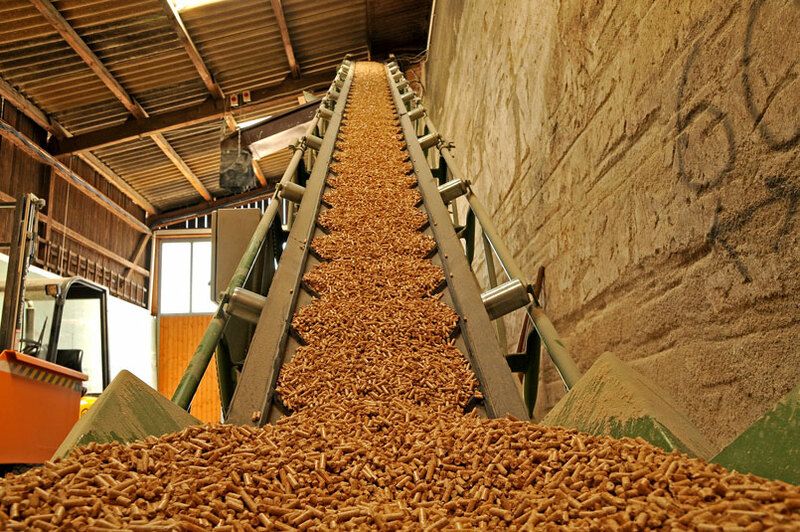 To completely master the wood pellet production process is not easy. That’s the reason why GEMCO writes this guide for you. Download it and read, you will learn everything about large-scale pellets production.